Jump start your personal growth with our intensive Chakra Boot camp!! This program focuses on Chakra Intuition. $99 for the entire program!!! Discounted Individual Consultations with Dr. Christina are also available during your Boot Camp! 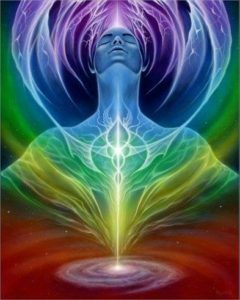 Chakra Boot Camp-Chakra Intuitive Development: Take an intensive personal growth journey from your Root Chakra through your Crown Chakra, exploring intuitive and psychic themes and functions of each energy center. Everyone has the ability to reach higher states of consciousness and harness their intuition! Discover and develop your own intuitive abilities! Many think that all intuitive abilities are associated with the Third Eye Chakra, but each Chakra is a processor and transmitter of psychic information. Join Dr. Christina Wilke-Burbach, Holistic Health Consultant, Spiritual Counselor, Reiki Master Teacher, Ordained Minister, and Lightworker on an intensive journey through each of the main Chakras and begin to manifest your own inner knowing, wisdom, and intuitive guidance. This series will cover intuitive abilities of each Chakra, how to open and close your Chakras, and exercises for developing intuition. We will also practice techniques in class so everyone can experience their own powerful potential! Classes will cover transmutation, clairsentience, clairaudience, empathy, telepathy, claircognizance, clairvoyance, and more! The Program: This is a recorded, self-guided program available to anyone anywhere! This is the second Chakra Boot Camp program offered by Dr. Christina and focuses on Chakra Intuition. Additional Boot Camps offered by Dr. Christina focus on other dimensions of the chakras including physiology, spiritualty, energy, and psychology. You can take the boot camps in any order. Each Boot Camp is originally offered as a 30 Day live program and then once completed, it is available as a recorded, self-guided program. In this program, you listen/watch a 2 hour recorded session once a week (or according to your schedule). Each session addresses two chakras. Each session will build on and expand topics discussed in the previous session. There will be intuitive development activities for participants to work on between each group. This is a dynamic opportunity offered by Dr. Christina! Join us!! Activate your Chakras, build your intuition, and heal your life!! Welcome! This session is an introduction to the program. You will set your intention/goals for the Boot Camp. Dr. Christina will briefly review basic chakra locations and functions. Students will learn how to open and close their Chakras, tips to increase intuition, how to establish energy boundaries, and basic psychic protection. We will also cover intuitive ethics. Root and Sacral Chakras. This session will explore the intuitive abilities of the Root and Sacral Chakras. Class time will include exercises and practice in using these abilities. Abilities covered include clairsentience, psychometry, and transmutation. Solar Plexus and Heart Chakras. This session will explore the intuitive abilities of the Solar Plexus and Heart Chakras. Class time will include exercises and practice in using these abilities. Abilities covered include clairempathy, affinity, and gut feeling. Higher Heart and Throat Chakras. This session will explore the intuitive abilities of the Higher Heart and Throat Chakras. Class time will include exercises and practice in using these abilities. Abilities covered include telepathy and clairaudience. Third Eye and Crown Chakras. This session will explore the intuitive abilities of the Third Eye and Crown Chakras. Class time will include exercises and practice in using these abilities. Abilities covered include clairaudience, pre-cognition, retro-cognition, channeling, and claircognizance. The program consists of 5 weekly recorded webinars that were taught to a live group of students February-March 2017. You can hear the students interact with Dr. Christina and ask questions and discuss class content. It’s like you are there with them! The program was originally recorded as a 30 day boot camp with weekly sessions. But you can complete the boot camp at your own pace. Within 24 to 48 hours after receiving payment, Dr. Christina will email you the class recordings, class workbooks, and additional written materials for the entire program. Students can download and watch/listen to the webinars via Windows Media Player, VLC, or ITunes as many times as they want! Dr. Christina is highly responsive and quickly replies to your emails if you have any questions. Registration: The fee for the 30 day program is $99. To Register, pay for the program here https://www.paypal.me/mindsoulandself and notate that the payment is for the Intuitive Development Boot Camp. Please contact Dr. Christina at mindsoulandself@yahoo.com with any questions. Dr. Christina will email you the recordings, workbook, and additional materials for the entire program within 24 to 48 hours of receiving your payment.